City Officials in Fort Scott, Kansas, located about 95 miles south of Kansas City, say that they haven’t been able to entice national providers to bring high-quality Internet access to their town of about 8,000 people. That may be a good thing — Craw-Kan Telephone Cooperative is building out fiber in Fort Scott as early as 2019. Planning for the network has involved collaboration between Fort Scott and the cooperative. Before bringing connectivity to residents, the cooperative has been deploying to a local industrial part, the airport, and the golf course. The plan has included an Exchange Agreement between the city and Craw-Kan which allows the co-op to use vacant conduit to connect Fort Scott’s Water Treatment Plant to the golf course and the airport. Fort Scott will also provide an easement for a fiber node at the golf course. Craw-Kan will provide six fibers for the city to use along this part of the route, and will also install vacant conduit for the city during construction at another location. The additional conduit will be earmarked exclusively for the city’s use. City officials and representatives from Craw-Kan have been working on the deal and the project since the fall of 2017. At a recent City Commission meeting, City Manager Dave Martin said that Fort Scott was excited that the cooperative was bringing gigabit Fiber-to-the-Home (FTTH) connectivity to town, noting that they’d tried to attract ISPs that would offer better services. Suddenlink offers services in parts of town and AT&T’s DSL is also available. Craw-Kan will provide $70 per month symmetrical gigabit connections with no data caps in addition to 10/10 and 50/50 for $50 per month and $60 per month respectively. Installation is free and a Wi-Fi router is included in the monthly rate. The Fort Scott project is the latest in the Craw-Kan portfolio as they work with local communities in the region. Further south in Pittsburg, Craw-Kan has been building their fiber optic network for about two years. They’re also serving Frontenac, Franklin, and Arma. This summer, the cooperative took up residence in a new Pittsburg development where they offer gigabit connectivity, Block22. The project is a collaboration between the city, Pittsburg State University, a real estate developer, and Craw-Kan. In addition to student housing on the upper floors, there is more than 16,000 square feet of workspace for entrepreneurs on the lower floor of the restored space. What was at one time the National Bank and Opera House buildings now contains a business incubator, conference room, and environment where students and entrepreneurs can mingle. Craw-Kan provides the Internet access for the business incubator and has space on the main floor. In addition to Craw-Kan, a few of the committed businesses to Block22 include a coffeehouse, a web development and mobile app company, an investment consulting firm, digital marketing firm, and art gallery. The cooperative, headquartered in Girard, began with a group of locals in 1952 and started with 14 telephone subscribers in 1954. They grew rapidly by purchasing other nearby telephone exchanges and by the end of 1954, the co-op had 24 employees, seven exchanges, and 1,422 subscribers. They continued to add exchanges and were even operating in Oklahoma and Missouri by the mid-1970s. “We see a need in the area for better internet connections, for faster Internet connections, so we don't see ourselves slowing down. We're gonna go and keep looking where this is some need and as long as we're supported, we're gonna try to make that work." 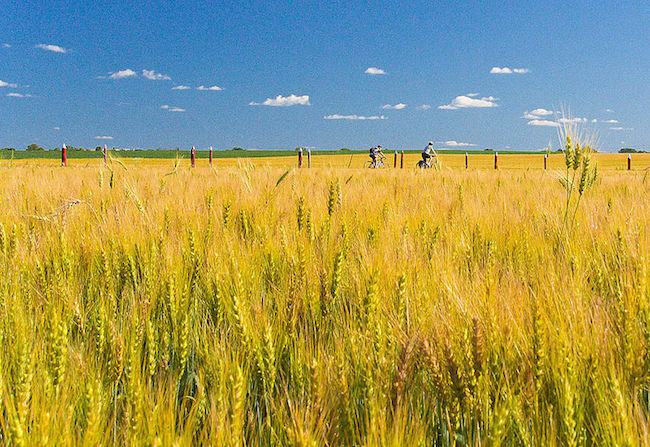 By cjuneau (Wheat Field) [CC BY 2.0], via Wikimedia Commons.